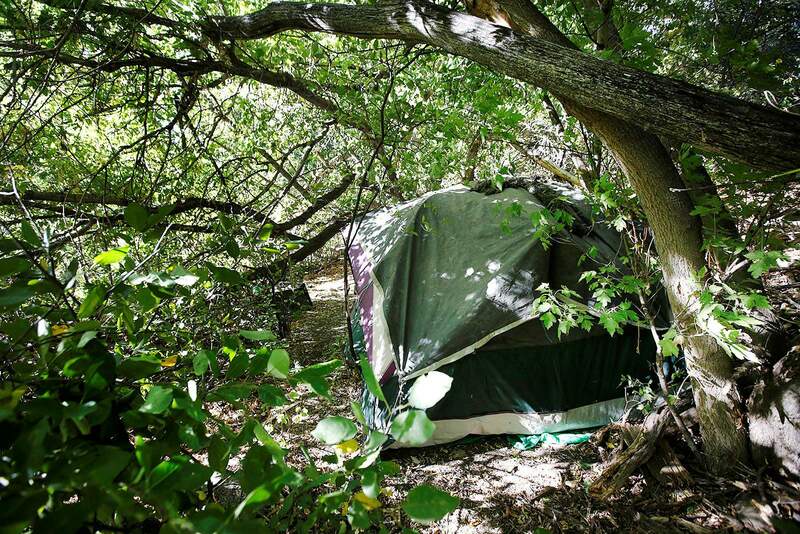 The city is proposing that camps like this one along the Animas River Trail near Escalante Middle School could not stay up unless given “written consent” from the city manager. The proposed rules would further define and regulate sleeping on public property, permitting such activity only with written consent from the city manager or other designated employee between the hours of sunset and sunrise on city open space. It would also outlaw sheltering in recreational vehicles while allowing sleeping in passenger vehicles. The ACLU and National Law Center said in a letter to the city after the rules were proposed in November that the policy, if adopted, would violate the Eighth Amendment, which guarantees the right against cruel and unusual punishment; the 14th Amendment, which, in part, guarantees the right to due process; and the Americans with Disabilities Act, which prohibits discrimination based on disability. Lynne Scholler, who spoke during public comment, brought up the ACLU and National Law Center’s threats and suggested it may not be appropriate for the city to take on the cost of litigation, especially as the city prepares to ask for a tax increase in April. “This ordinance is as unrealistic as it is inhumane,” Scholler said. The prospect of litigation was noted but not discussed. Councilor Chris Bettin asked if this ordinance could be amended in the future to lift restrictions and encourage long-term solutions. The city is working with La Plata County and other organizations to come up with long-term solutions, and this ordinance is not that, Bettin said. Councilors vetted the minutiae of the ordinance, requesting that the city allow an hour before sunset for people to set up their shelter and an hour after sunrise for people to strike their shelter. “I believe it’s fair to say the changes that we’ve proposed are more clarification updates and will have very little change in the enforcement of camping and sheltering in and around the city,” said City Attorney Dirk Nelson at the meeting. Mayor Pro Tem Melissa Youssef said that the city isn’t changing the way it enforces camping and sheltering with this ordinance, and if the council has a problem with how it’s being enforced, something should have been done a long time ago. The decision to revisit the rules came after the city put a moratorium on its camping rules in the wake of a 9th Judicial Circuit Court decision that found it unconstitutional to make it illegal for people to sleep on public property when they have nowhere else to go. The direction by council to draft an ordinance as proposed by staff was unanimous. Donna Mae Baukat, executive director with Community Compassion Outreach, an advocacy group for people experiencing homelessness in Durango, did not attend the meeting because she felt her concerns would fall on deaf ears, she said in an email to councilors Youssef and Bettin. Mayor Sweetie Marbury, who is named in the eight-page letter condemning the city for its proposed rules, said in an interview she doesn’t believe a lawsuit will come if the ordinance is drafted as proposed and passed. These rules are guidelines for people in the city – and city staff is working with local organizations to develop solutions to get people without homes into a permanent shelter, Marbury said. The city doesn’t have the resources to address the problem on its own, she said. “It has to be a partnership,” Marbury said in an interview. But the ACLU and National Law Center say the proposed rules do not go far enough to address the real issues facing the city of Durango. “The current proposal misses the opportunity to pursue real policy solutions to homelessness and instead adopts a punitive and rigid policy approach cut from the same cloth as those that landed Durango in its current predicament,” lawyers for the ACLU and National Law Center wrote in a letter to city councilors. The ACLU and National Law Center argue that the city, with these proposed rules, is not providing a permanent path to housing for individuals and, in permitting the “act” of sleeping only through “written consent,” would create a rule that could work as a proxy for criminalizing homelessness as a status. “Rather than crafting policies that approach homelessness with compassion, ingenuity and resources, the new proposal sets up homeless residents for continued unnecessary involvement with the criminal justice system simply because they lack permanent housing,” lawyers for the ACLU and National Law Center wrote. The proposed rules also rob people experiencing homelessness of due process, the ACLU and National Law Center argue. There’s no specificity in the language to guide the city manager or “other designated official” that “affords standards for evaluating the adequacy or availability of alternative shelter,” lawyers wrote. The due process clause of the 14th Amendment guarantees fair treatment under the law for all. Without specific standards, the city could endeavor in “arbitrary and discriminatory enforcement,” lawyers argue. Nelson said in November he is confident the city’s proposed rules are legal. “I can simply say I disagree (with the ACLU and National Law Center),” he said at the time. Sam Mamet, executive director of the Colorado Municipal League, said the city has the right to disregard the ACLU and National Law Center letter – it’s the job of city leaders to determine what is best for the community, not the ACLU and National Law Center. And if passing the rules does end in a lawsuit, it’ll be up to the court to decide whether the city is violating federal law, he said. Do you support the city of Durango drafting rules that would permit sleeping on open space only with the written consent of the city manager?